Continuing our detour off Highway 11, Virginiatown and Kearns are two villages (population approximately 800) northeast of Krugerdorf via Highway 624. 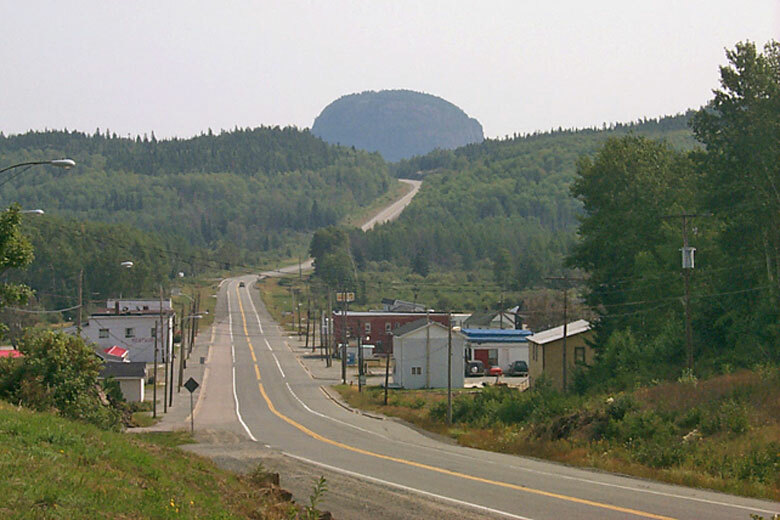 V-town is just a tad west of the Quebec border on the northeastern shore of Larder Lake. Built in the shadow of the great Mount Cheminis, the area known as Virginiatown is comprised of three different villages – Kearns, North Virginiatown, and Virginiatown proper. I would have done separate pages for all three but a) I don’t have a tonne of info, and b) I’m not sure where one village ends and the next one begins on a map. I think North Virginiatown is north of Highway 66, Virginiatown is south of it, and Kearns is just a kilometre or two east. Virginiatown is actually much closer to Rouyn than Timmins or any other larger centres in Ontario. Therefore, (and I might be wrong, but) I’m pretty sure that V-town, as it is affectionately called, is a largely francophone community which had its heyday with the northeastern Ontario mining boom in the early half of the 20th century. So, I checked this fact. Statscan tells me that Virginiatown and area is largely francophone. But emailers and posters (before I lost all the posts) tell me that nearly no one speaks French in V-town. So, I don’t know. Virginiatown sprung up with the expansion of the mineral rush which began in Cobalt in the early 1900s and drove north founding towns like Kirkland Lake and Larder Lake. V-town was famous for the Kerr Addison Mine, which at one time was the richest gold deposit in North America. The gold from the first Canadian 5 ounce gold coin was mined from the Kerr Addison. Today, a coin monument stands to commemorate this Virginiatown achievement. Like all boom towns, this had to come to an end eventually. The Kerr Addison Mine shut down in the 1990s, and while there is still exploration and some smaller gold ventures in the area, Virginiatown is pretty sleepy nowadays. Check out the link to Louie Palu’s photos below, it contains some fantastic shots of mining life in Larder Lake and Virginiatown mines. Does V-town’s big weird coin outdo Larder Lake‘s flying fish? There is a boat launch to Larder Lake, and you can access nearby Labyrinth Lake where you can catch northern pike, bass, and walleye. According to google, there is a ceramic shop in town as well. You can visit the Virginiatown Heritage House for a history of the town and its mining past, or hike the Heritage Gold Trail to view underground mining equipment. Mount Cheminis is, in my opinion, the coolest thing in the area. Shooting up from the trees like the bum of a thick marker, it rises majestically above V-town and is visible from Highway 66. You can hike up the summit from local trails. Check out some of the nice pictures in the links below. 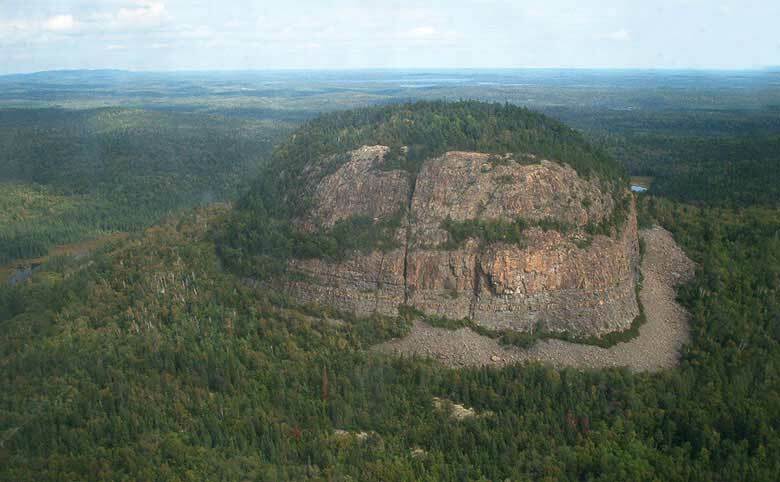 Andre emailed to let me know that Mount Cheminis (known as Mont Chaudron in French) is techhnically in Québec. Services in town include gas (Guy’s Service Station), a small grocery store, and the usual small-town-northern-Ontario stuff like the Bear Creek Bait and Tackle shop and a curling club. Chez Lucie is a drug store, convenience store, and video rental in one, and Armando’s “Le Bar” is a local diner and watering hole. The Cheminis Lodge provides bed and breakfast facilities and lodging, as does the Hilltop Inn. The only time I drove through Virginiatown was en route to Rouyn. 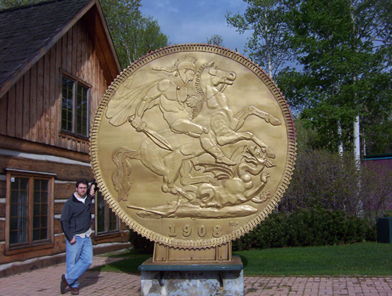 I was on a schedule, so I stopped to take a picture with the big coin and that’s it. Please help me add to this page – send personal anecdotes, history, photos, and advice to info (at) highway11 (dot) ca. For an archive of the 30 comments that were posted to Highway11.ca’s profile of Virigniatown/Kearns between 2008 and 2012, please click here. This entry was posted in Temiskaming and tagged big weird things, francophone, hiking, mining by Highway11.ca Editor. Bookmark the permalink. 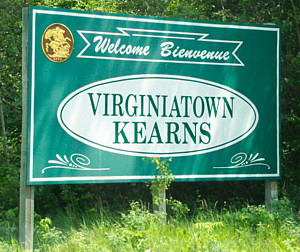 Hi, I grew up in Kearns from grade 1 to grade 4 & attended Ecole St Louis in Virginiatown. This was roughly 35 years ago. The community back then was very much francophone, however, I would say it was billingual. Very few people only spoke english. If you are going up towards Virginiatown, Kearns ends just as you start going up the hill past the old chip stand on the right. V-town starts just before the arena & Virginiatown starts right before the french catholic school on the right side of the hwy, but yes, v-town is on the right side of the hwy & Virginiatown is on the left side. Kearns was a great place to grow up. I have many good memories & long for the quiet days of my childhood. We knew everyone & you never had worries about your neighbours. On Sundays everyone would drive out to the dump near Mont Cheminis to watch the bears & wild cats. Man, I miss them days. I worked in VTown at the Kerr during the Summer of ’58,my uncle George was the electrical foreman there. Myself and another student lived in the mine bunkhouse,quite an experience ,quite a Summer. Went to Rouyn with other student workers for party time. Stayed at the Radio hotel in Rouyn…..great memories.. I was born and brought up in Kirkland Lake. My dad had Breland’s Men’s and Boy’s Wear. I remember Cliff Lamoureux in V-town – used to buy some pretty funky furniture there. I once bought an old barber’s chair as a gift for my husband who later passed away. Deb Manseau was a dear friend of mine and I participated in several “Me You and The Rest of the Crew productions with Al Manseau and Art Gutmanis also from V-town. Wow – so many memories. I haven’t moved far from Ottawa. Since my retirement for air traffic, my spouse Louise and daughter Réjane and I now operate a horse farm near the village of Hammond, Ontario, about 30 km east of Ottawa. I saw a reference to Morley. Regrets. I hope this finds you well. It was a delight to go down Memory Lane, even briefly. Elaine Breland! Hope you are doing well! I am Clifford’s grand son. So cool to see memories of my grandpa dad and aunt. I started my life in Virginitown, we lived a block behind the fire station which was located across from my grandpa Clifford’s barber shop. we moved to Kirkland lake when I was 5 but I still remember spending time with grandma Grace and grandpa Clifford. I am now living in Kelowna BC and have published my first book which chronicles my life starting in Virginiatown. On a seperate note,there is a movie I think it is called highway67 that was filmed in Virginiatown. They used my Grandpa’s shop and he made two cameo appearances. Bye for now, Richard J. Lamoureux, Kelowna BC. In the ’50s I taught music in the schools in Dobie, V-Town and Kearns. The picture above of Hwy 66 east is Kearns and not V-Town. Virginiatown is actually off the highway a bit. With my wife mother and sister-in-law we took a picnic lunch and climbed Mount Cheminis. Somewhere I have pictures from that expedition. Such views! I produce and host a radio show on Saturday mornings in the Shuswap in BC, called ‘Driving Through My Memories’ as I spent over 50 years as a long-haul trucker traveling North America. This week I am doing a bit on a trip from Nipigon, Ontario to the Quebec Border at Cheminis. Another week we will continue through Quebec to Montreal and eventually the east coast. You can hear it by going to our website http://www.voiceoftheshuswap.ca and follow the instructions for streaming on your computer.